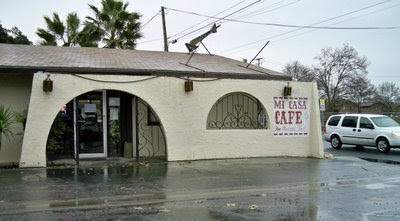 Memories and Reminiscings of my Winton, CA families, also current everyday happenings. Links to old family pictures for genealogists. Living Alone . . . And Liking it? I grew up in the Winton area, graduated from Winton Grammar School in 1952. 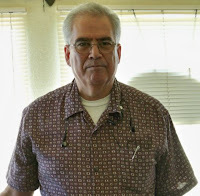 I belong to the Winton Historical Society and the Merced County Genealogical Society. I am now retired from the County of Merced. It's time for our New Year's Resolutions. I have been thinking about this for a while now. At first I wasn't going to have any "Resolutions" but decided on just a few. Everything else I have on my lists will be more or less "suggestions." I don't like to move out of my comfort zone! Resolution #1 ~ I purchased a copy of "The One Year Bible." it is not laid out like a regular Bible; for instance, on January 1, you read part of Genesis from the Old Testament, part of Matthew from the New Testament, some verses from Psalms and last something from Proverbs. January 2, same books, different verses. I'll see how I like that. My resolution is to read the entire Bible in one year. If I get behind, I'll have to play "catch-up." I also bought the "Amplified Bible" which says it captures original Greek and Hebrew meaning. I noticed it does make it more interesting. Resolution #3 - I plan to continue looking for out-of-the-ordinary Perennials and keep them growing in the yard. The rest I am reluctant to post here. It has to do with being more organized, "a place for everything and everything in its place." If I make that a resolution, I think I will set myself up for failure. It's one of my "suggestions." There will be lots more of those. They are fun to think about and put on paper. Today is my grandson's 16th birthday. The family drove to Merced to celebrate Tom's birthday with his Dad's family. On the left is Tom and his birthday cake with the 16 candles. Next picture is Tom and his sister eating dinner. It was a short visit. The party was Saturday night; they drove home the next day after the early church service. Christmas is almost over. Carol and I spent Christmas Day with Elsie and her family. We enjoyed it very much and were happy for the invitation. We both agreed though that Christmas is not our favorite holiday. I'm not sure why. Is it remembering the pressure to try to make a perfect day for our children? Our children are grown and on their own now, so that shouldn't be it. Are we thinking back to when we were in grammar school and dreaded being asked by our peers what we got for Christmas? It never was very much. Our friends probably just wanted to tell us what they got, but we didn't realize that. Whatever the reason, we are glad when Christmas is over. I was surprised that my granddaughter, Mandy feels the same way. Maybe we get tired of the commercial hype to buy, buy, buy, which we don't succumb to, by the way. 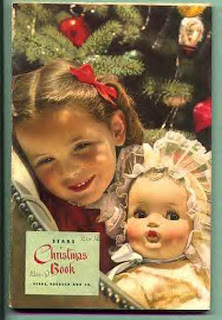 Pictured is the cover of the 1942 Sears "wish book," one of the catalogs that we enjoyed so much in our youth. I think my favorite holiday is New Year's. It's a time when you can think about changes you want to make in your life. Write it down on paper and dream how things are going to be in the new year. A time to reinvent yourself. It always reminds me of playing ball and jacks when I was a kid. Someone was always hollering "overs," which kind of irritated me. Just play what you rolled out! It's always fun though to think about and decide what you want to include in your life and what you'd like to get rid of. I'm going to start my lists now. They aren't 'resolutions' so no pressure there. Just some thoughtful insights. I'm hoping. So, now I will watch my favorite Christmas movie; "The Christmas Story" about the little boy who wanted a BB gun for Christmas. TBS is going to show it ALL DAY tomorrow. I will be at my sister's house for part of the day. So, it will be a nice family holiday tomorrow. Well, gotta go, my movie is starting!! Sunday was the Christmas party in Hornitos at my sister-in-law's. My sister Carol went with me. I don't really like to drive through Merced Falls and on to Hornitos by myself, so I was glad for the company. The Richards and Riise families were well represented. 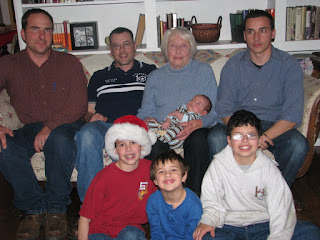 Here is a picture of Kathryn and her great-grandkids. Sorry I don't know how to get the glare off the eyeglasses. We had a good visit and we all stuffed ourselves with lots of good food. To see more pictures of those present go to this set at flickr. We had a nice gentle rain all afternoon.It was dark driving home, had a detour on G Street and got lost somewhere north of the junior college. Oh well, it was dark, what can I say? Last Tuesday, two of my sisters and I went to Glenn to attend funeral services for our cousin, Rodney Giesbrecht. I can't remember the last time I had seen him. The Glenn Mennonite Church was filled to capacity with people I didn't know. Many were relatives, but I had to be introduced to them. Rodney's sisters came from Idaho, so I hadn't seen them in a long time either. It makes you think back to when you were young and your cousins introduced you to the game of Monopoly. How quickly the years go by. There was quite a long procession of cars going to the cemetery in Willows, then back again for the meal at the church. After that I called my daughter who lives in Orland; she teaches at a very small school in the country. She left the school early and came out to the dairy and gave my sisters the story on making cheese. It was getting late by then and we wanted to see the new Mennonite Church West of Willows. 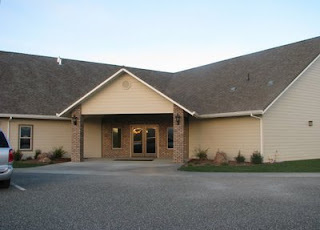 Here is a picture of the front entrance. The church sits on a hill with pretty green fields all around. Very nice setting. I was told that Mennonite members have farms in the surrounding area. Elsie drove us there and back. It makes a long day when you have to get up before 4 a.m. and none of us sleeping good the night before. Why does that always happen when you are going somewhere? But we made it there o.k. in plenty of time and I got home around 9 p.m. Maggie was watching for me at her little cat door as I drove in the garage. So, this is the season for potlucks. Again I am using the "Hometown Recipes" book, but am using others' recipes. The Orange Salad Delight on page 19 and the Ribbon Salad on page 20. So, get out your little Winton book and try some of the recipes. I can't wait to try some of my Dirks cousins' recipes, they are all good cooks! The other salads I am making don't require a recipe, i.e. carrot raisin salad and macaroni salad. 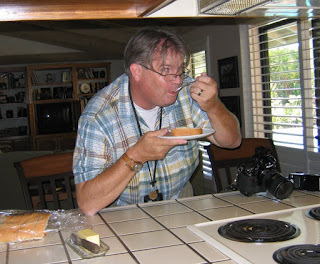 Here's a picture of the Merced Sun-Star photographer who came out to Rosalie's house when the book was first published. He is trying out one of Avanell's recipes. The Sun-Star printed a full page and a half article. It was great publicity. I'm not trying to sell the "Hometown Recipes" book, we only have 2 or 3 left to sell. We did a second printing, but will not do another one. So, who knows, someday, it may be a collectible. 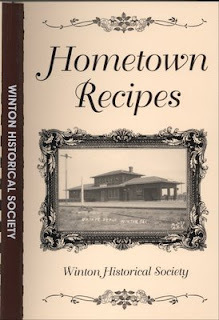 Last Sunday, I decided to make the "Chicken In Red Wine, Hunter's Style" which is on page 33 of the "Hometown Recipes" book published by the Winton Historical Society. Well, o.k.,I contributed that recipe, it's a favorite that I haven't made in years. I searched in the cupboard and found a bottle of red wine with the year 2000 printed on it. My daughter advised me to taste it to be sure it hasn't turned to vinegar. It was the best wine I remembered ever tasting. It's a Zinfandel,made in Sonoma, CA at the Forest Glen Winery. It's probably not a cheap wine, it's too smooth. I had some with my dinner and will have some tomorrow with the beef stew I plan to make. I decided to buy stew meat after I saw the brown and serve sour-dough French bread at the grocery store that my husband used to buy quite often. The Chicken in red wine was delicious, I cooked spaghetti to go with it. I ate it for 3 days in a row and never tired of it. It must have been the red wine that made it so good. It wasn't exactly "chicken one day and feathers the next" but I don't remember what I had for dinner after that. Sometimes it's tamales from the freezer that I bought from the Mexican restaurant close by. The week before I made the "German Cabbage Soup" on page 9 of the same recipe book. It's now a favorite recipe too. Oh, I forgot, I made the "California Vegetable Casserole" on page 87 of the "A+ Recipes" published by the Grace Mennonite School Of Winton. So, little by little I am getting into the 'cooking from scratch' mode. Sort of. Like I said before, I only have to please myself. It looks like this is going to be a Foggy winter. We've had dense fog already, but lucky for me, I didn't have to go out in it. Not yet anyway. My sister and I have been invited to the Ballico Mennonite Church for the annual Christmas dinner and program that their youth group puts on. We both really enjoyed it last year. It's at night and this year, I'm a bit worried about the fog. My sister-in-law in Hornitos has a family pot-luck near Christmas time each year, which is a day-time party, but still it can be pretty foggy driving there too. I've been driving to my daughter's house in Northern California for Christmas the last two years, but this year I may stay home because of the weather. It just isn't safe out there on the roads when the fog is so heavy. And I guess this is the year for it. 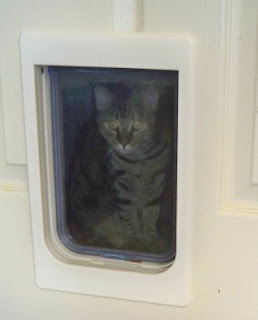 Cat Doors: I had my nephew install two cat doors about a year ago, one from the utility room into the garage and one from the small garage door to the backyard. Well, Maggie was afraid of the newly installed automatic garage door opener. It just made too much noise and she always ran away from it. I was hoping to put her litter box in the garage, but it's still in my bathroom. One day I guess I was gone too long. When I left, Maggie was going to take a nap on the bed. When I got home, 4 or 5 hours later, she was outside on the patio!! What a surprise! She finally decided to use the cat doors. She looked so pleased with herself. Since then she has let herself in and out of the house several times. Now I don't have to worry about going to the door to see if she is getting cold and is waiting to be let in. I know if she wants in bad enough, she will come in on her own. I wonder if she realizes how lucky she is and does she remember her humble beginnings at the animal shelter? I doubt it, she's been living the 'life of Riley' for almost a year and a half now. 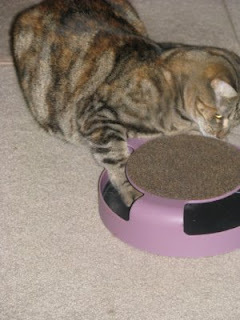 Maggie loves to play, here are pictures of her playing with the toy mouse that she can push around and around. It's kind of a "now you see it, now you don't" kind of toy. The top part is a scratching area. Do you have a favorite Christmas memory? This Tuesday we will be encouraged to share Christmas memories in Winton at our historical society meeting. My favorite memories are of the Christmas Pageants put on by the Winton Grammar School. Fourth through eighth graders participated, some students in the Voice Choir, reciting the Biblical verses pertaining to the first Christmas and some students in the Music Choir, singing the Christmas Carols. The scenery, costumes and story was the same year after year, only the 'actors' changed. I think most students enjoyed being a part of it. I have asked around if anyone has pictures of the play, but so far have not found any. It would be a nice addition to the next Winton history book if any pictures could be found. This pageant is no longer a part of the Winton Christmas season. Too bad. It was nice and gave people a feeling of the Christmas spirit. There are different Christmas customs around the world. In the Netherlands they have Sinterklaas. My daughter wrote about this year's celebration at DB's Aunt and Uncle's house in Holland at her blog. To read more about Sinterklaas, do a google search or read the article at wikipedia. Well, Black Friday has come and gone. I intended to go see what Gottschalks had on sale, but it was such a dreary day and I guess I was in a dreary mood, so didn't leave the house. Besides I couldn't think of anything I really needed. It seems like every year the merchants expect to sell more than the year before. Good grief! What's wrong with cutting back? People buy way more than they need. In a way the slow-down on the economy is a good thing because it makes people realize they don't need a lot of the stuff they buy. People used to make do with what they had and that's not a bad thing. I went to Mervyn's and Circuit City the other day, both stores are closing because of the economy. I feel bad for the people losing their jobs. But if the U.S. would manufacture more of the products they sell, there would be enough jobs for everyone. The items might cost a little more, but it would be worth it. Make quality merchandise like they used to. Things that would last and you wouldn't have to be replacing them, which usually costs more money in the long run. Christmas will soon be here and the stores are full of cheap plastic toys that will be bought for the kids. They will get broken and thrown in the landfills before long. There is so much waste. It's a shame. On a slightly different note, my daughter wrote about the current situation on her blog and how it affects her in the Netherlands. I agree with what she wrote and wanted to share it with you. There were a few odd things I noticed or learned in Europe, at least I think most Americans would consider them odd. 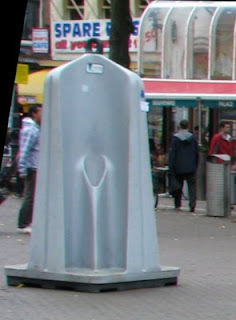 First off is the outdoor urinal, pictured on the left. Sure it's practical, but I don't think you'd see one in the U.S. There are four sides to it, but I've never seen it that busy. The men can relieve themselves in public without exposing themselves. It's quick and easy!! But, no place to wash their hands. My daughter's house has three stories with the main bathroom on the 2nd floor with two bedrooms. There is a small bathroom? with just a toilet on the ground floor. The surprising thing is that there is no sink to wash your hands. Surprising because the Dutch are so CLEAN! Why wouldn't they want to wash their hands after using the toilet? The common practice then is to wash your hands at the kitchen sink or put antiseptic wipes or a similar item in the small bathroom. An odd thing about dish washing; if this is done by hand, it is a common practice in Europe, (not just in Holland) to not rinse the soap off the dishes. Just wash them in the nice soapy water and let them drain. Of course if you have a dishwasher, they are made with the rinse cycle. 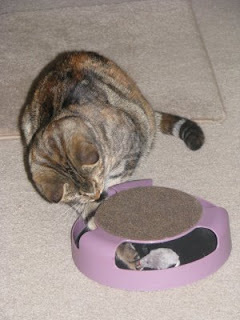 Most houses or apartments in Holland are rather small, so if you have a cat, where do you think the litter box is located? I put my cat's litter box in my bathroom. Oh, that's a terrible thing to do. Bathrooms are supposed to be CLEAN!! Where do the Dutch put their cat's litter box? O.k., it's true, I never smelled the litter box, but to say it's in the kitchen seems a bit odd. Only the older homes have a small bathroom downstairs with only a toilet and not a sink. My daughter's house was built in the 1930s. The newer or renovated houses have a sink in the little bathroom. Today I went with my sister to her granddaughter's house for the Thanksgiving feast. I thought it was very brave of the granddaughter to tackle such a big undertaking, but her mother and mother-in-law was there to help. Not to mention her step-dad who made the gravy with nary a lump. Everyone brought food, so after we all stuffed ourselves, there was still lots of leftovers. 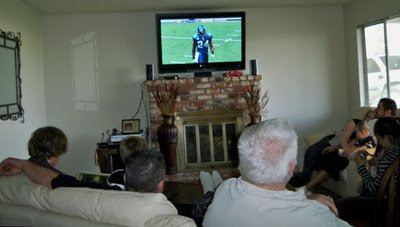 The granddaughter, mother and mother-in-law cleaned up the kitchen, while the men watched football in the living room. A typical Thanksgiving Day. I imagine this scene was repeated in homes all over the U.S.
We didn't all say what we were thankful for, but I'm sure we were all thankful for family. The Gonzales family lost several close family members as did my sister and I. So, I think we were just grateful for each other. My daughter had an interesting post on her blog today about Thanksgiving. Today was just an ordinary day in Europe, but my daughter remembered it was Thanksgiving in the U.S. and thinking about her family over here. I hope everyone had something to be thankful for today. It was the day before Thanksgiving in 2007 that my granddaughter, Mandy was on the Rachael Ray Show. How did that come about? She found the RR website and submitted a story about herself as a cheese maker on a small dairy in Northern California. She pitched the idea of a "make-over" since her work required her to wear rubber boots and pants and hair net. She wanted to feel more feminine and asked Rachael Ray how she manages with such a busy schedule. To Mandy's surprise and delight, they "bought" her idea and hired Cojo to do the make-over. I was at the dairy when Cojo arrived to take some pictures (yes they are amateur pictures). It was definitely a Fun Day. Both Mandy and her boyfriend John were on the show. To see Mandy's posts about the Rachael Ray Show, click on here and here. The Rachael Ray website has a cute video of Mandy and Cojo. Mandy has also been on the California Country TV show two or three times and also in their magazine. She has many write-ups in the Chico Enterprise newspaper and also the Sacramento Bee newspaper and a local Sacramento magazine. Oh, and the day the Rachael Ray Show aired, Mandy was on the Chico TV morning news show. event. While there, John proposed to Mandy in the Valentino Park! How romantic is that? Congratulations!! 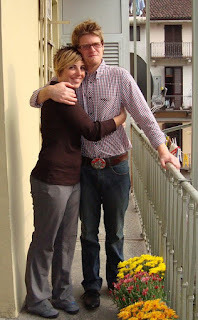 The picture of Mandy and John was taken in Italy by her aunt who traveled from Holland to meet up with them. To see what Mandy and John are up to now, follow this link. See what her Aunt Sandy wrote about the trip to Italy. Mandy, your Grandma is very Proud of you. The Roses are still blooming. I haven't been cutting off the dead blooms because I thought it was time to let them "harden off." Our weather has been unseasonably warm, so they are still blooming. 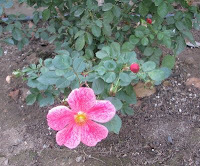 Here is a picture of "The Impostor" a Floribunda that will get about 3 feet tall and as wide. It was named "The Impostor" because it kind of looks like a Camellia. The Butterfly Bushes seem to be through blooming. A friend wondered what the flowers look like, so here is a picture of "Ellen's Blue." The flowers kind of resemble a lilac flower. 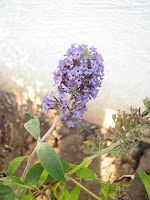 I found most of the Butterfly Bushes at Home Depot here in Merced. I thought I'd bought one of each color: "Black Knight"; "Pink Delight"; "Royal Red" and "Ellen's Blue" all came from Home Depot. "Adonis Blue" and "Strawberry Lemonade" came from The Greenery. I missed one at Home Depot, "Nanho Blue" not sure where I would plant another one. They do like the sun. I sure hope the Humming Birds appreciate my efforts to keep them happy in my back yard. I keep hoping they will make a nest on the patio, so I can watch them up close. My friend was lucky enough to have Humming Birds on her patio come back year after year until her husband had to move the electrical cord they made their nest on. Maybe next year they will find a good spot on my patio. 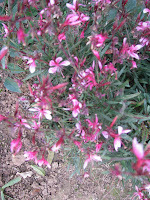 Picture #1 is Pink Cloud Gaura, blooms late spring through fall, grows to 2-3 feet tall and as wide. 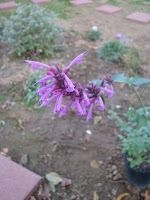 Picture #2 is Salvia greggii, Autumn Sage "Lipstick" grows to 2-3 feet high and wide with hot pink flowers. The Sunset Western Garden book says it is evergreen or deciduous shrub, I guess depending on how cold the winter gets. Picture #3 is Agastache Barberi "Tutti Fruitti" a Perennial that grows to 30 inches high and 2 feet wide with tubular reddish purple flowers. I did a Google search on this plant and learned that the humming birds go crazy over it, so it was a good choice. I also bought another Butterfly Bush. This one has variegated leaves and is named, "Strawberry Lemonade." It has bright pink flower spikes. The tag says it's Deciduous. So, that's what I bought today. I hope to get them planted soon, along with the rest of the Ranunculus corms. This coming Spring will be very exciting!! This time of year, harvest time in my backyard means the Oriental (Fuyu)Persimmons are ripe. They don't all ripen at the same time, so that's good. I just pick a few each day until they are all ripe and then give some away. They only fruit on the old wood, so the new growth up high, which is cut back every year, never has fruit only on the lower branches. Earlier this year I pruned some of the heavy low branches because I was afraid they were going to break off. Had to throw away a lot of green Persimmons though. The Pomegranates and the Satsuma Mandarins are also ripe. The Mandarins seem to be quite small this year, but the Pomegranates are huge as shown in the picture. Three Mandarins are on the left with one lone Persimmon on the right. I also have a "Honey" Mandarin which ripens in February or March. It has more seeds than Satsuma. The Pomegranate tree is still small, so only got about 15 Pomegrantes. I'm not sure what I am going to do with them. I see they are $2. each in the grocery store. Music: I did find "Remember Me" by T. Texas Tyler on a CD that I made of some favorite songs. I'll have to upload the new collection of "Oldies But Goodies" and make CDs of my favorites, since I don't especially like all of them. But first I have to figure out why I don't have any sound on this computer!! Hooray! The Presidential election is over. My man didn't win, but I guess I'm over it. Now I just hope the new president won't be able to keep all his promises, like spread the wealth around. I think that would be a mistake. People would have no incentive to work hard then to build up their business. Well, this is not a political blog, so that's all I'm going to say. 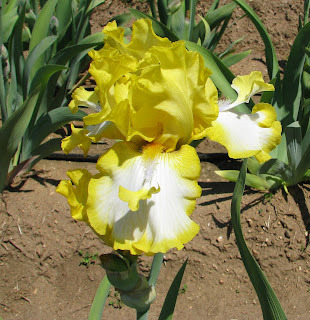 Pictured is another Iris plant I purchased this year from Superstition Iris Gardens in Cathy's Valley. This picture of "Splashacata" was taken in early May in their field. Can't wait to see them all bloom in my backyard. Today I had another chiropractic treatment with Dr. Reed. I won't have another one for 2 weeks, but he wants me to come in 3 times a week to exercise. Next time I get to start on another machine, the elliptical, so I'm excited about that. Eventually I will go once a month for a treatment. The exercises will strengthen my muscles and that should keep my neck and back in place. I'm enjoying the fall weather, haven't turned on the heat yet, but it's almost time for that. It does mean a change in diet. Out with the soda pop and stock up on milk. It's time for oatmeal in the morning, not just toast. I still don't have my computer completely set up yet. No sound. Everytime I have to reconnect the computer, I get something wrong and there is no sound! Grrr. I lost thousands of songs I had on my C Drive. Most of them came from my CDs, like the Time-Life "Your Hit Parade" series from the 1940s and 50s, Big Band music and the really OLD Country/Westerns, also from the 40s. A few that I lost came from downloads, like T Texas Tyler singing "Remember Me." I might have it on a CD somewhere if I look hard enough. It takes a lot of time to upload them all. The other day in a weak moment, I called the 800 number and ordered Time-Life's "Oldies But Goodies." They are the early Rock 'N Roll songs from the 1950s. Guess I am finally moving along, music wise. Saturday morning, I turned on my computer and nothing happened. Absolutely NOTHING would come up. I took my computer in and paid to have it worked on right away because I still needed to get a newsletter out before the end of the month. Darn! So, it was going to be worked on right away. Monday, I called to check on it and my hard drive was completely destroyed. They installed a new hard drive and tried to retrieve data from the old one. Wednesday afternoon I called again and we decided I might as well give up on saving anything from the old hard drive. What a BUMMER!! I could kick myself for not taking my computer in the first time I saw the error message on a blue screen. I didn't realize it was that serious. My granddaughter told me the blue screen is the "kiss of death." I haven't looked at the external hard drive yet to see what pictures I am missing from the C Drive. I want to know and I don't want to know. Anyway, I'm kind of bummed out right now. 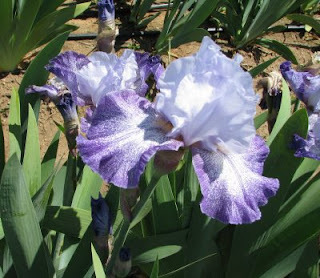 Here's a picture of "Abby and Me" one of my new Iris plants. Can't wait to see them all bloom. I took this picture in early May at the Superstition Iris Garden in Cathey's Valley. This is one of the Tall Bearded varities you can see on their website. Oh yeah, my back is much better. The other day when I needed to leave the house, Maggie the cat wanted outside. She knew I was going to leave and didn't want me to go. First she let me know she wanted out the patio door, then the front door, but I didn't let her out. So when I left through the garage door. There she was at the cat door, watching me leave with her big sad eyes. Why did I let that make me feel guilty? Probably because I know she doesn't understand. How can you tell a cat you're going to be back soon? Especially when you were gone for 3 weeks recently. Yesterday I had a relapse with my lower back pain and it really hurt. It took me 30 minutes to climb in bed. Maggie was sympathetic and licked my hand. So, I don't really know how much she understands. I went back to the chiropractor today for a treatment. No lifting and no garden work for a while. Oh well, at least I'm not back to square one. I wanted to do a little more work in the yard, but I guess that will have to wait. Not Exactly. There are a few advantages to being on your own, like not having to justify purchases you make (only to yourself), or being in control of the TV remote instead of never deciding what to watch. But that doesn't make up for having to talk to yourself or the cat. I usually talk to my sister on the phone at least once a day; have lunch with friends now and then, so it's not that bad usually. I keep busy with the yard and could be busier with the house. LOL. Today I bought some stepping stones for the back yard. Only got 15 this time because they are so heavy. Put 3 at a time in the wheelbarrow and put them in place in the backyard. One bad thing about being alone, you have to do your own grunt work or hire it done. So, I do what I can and take lots of breaks to think about what I want to do next. Usually I just want to sit and think with an iced drink in my hand. 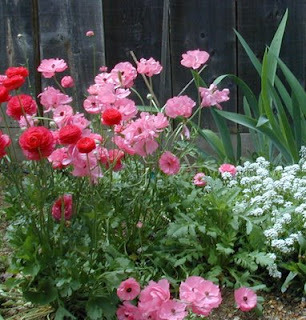 (grin) Tomorrow I better start planting those 100 Ranunculus corms that I bought this year. If only half of them bloom, it will be a beautiful spring. Several widows have told me that what they hate the most about being alone is having to cook for themselves. That took me by surprise because I don't mind that at all. Probably because my husband did all the cooking before. Everyone always told me how lucky I was and usually I thought so too, but sometimes I secretly wished he didn't know a thing about cooking and was easy to please, then I would have learned to be a good cook. So, now I am cooking whatever I feel like and don't have to worry if anyone else likes it or not. I have a lot of projects I want to do before I pass on. I took a small step in that direction today by going through a lot of old slides and took 106 of them to Costco for them to scan and put on a CD. I planned to do that myself, but it takes so much time, and I didn't really learn how to do it, so for .29 cents per slide, I felt it was worth it. They scan them at 300 dpi and that's supposed to be good enough for a 12x18 inch picture if you want one that large. They will be ready in a couple of days and I can't wait to see them on the computer. So, there is always something exciting happening around here. Pictured are a few red and pink Ranunculus from prior years. They all disappeared, so am anxious to have some blooming in my yard again. 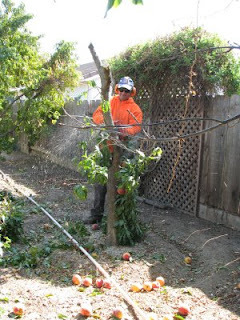 Here is Joe the gardener, removing another peach tree from my back yard. This is the fourth one. One peach tree fell over on July 4th, just before they were to ripen. It was a good tasting peach, Sun Crest, but planted in the middle of the back yard, so I wasn't too upset. The semi-dwarf Elberta peach was kind of weak, so that was removed. One of the O'Henry's lost a large branch a few years ago, and then the vine in the background got out of hand and choked out the other half, plus half of the Summerset peach. So, the only peach trees left are Flavor Crest and the young O'Henry tree. It will be so much easier for me next summer, I won't have all those peaches to pick up off the ground and toss in the garbage. I finally planted the new Irises I purchased this year. I hope they will be o.k., they got a little dried out. In the Netherlands, I noticed my daughter's neighbors had a lot of Butterfly Bushes of different colors. They were so pretty, that I went on a Butterfly Bush kick. I now have 4 of them, scattered about, hoping the humming birds will find them. I want to give the little birds some natural food, not just the sugar-water. I've been spending a lot of time in the backyard, moving plants around. Some women like to move furniture around; I like to move plants around. Still like to play in the dirt, I guess. I'm not through yet. The first thing I did when I got back from the Netherlands was call Dr. Reed's office and set up an appointment. I was in so much pain in my lower back while visiting my daughter that I couldn't put it off any longer. I had been to Dr. Reed years ago when he was still with Dr. Keller in Atwater. I liked the way he adjusted my neck and back, without any machines and thought I would look him up when I needed an adjustment. Well, the years went by and I had a lot of excuses; "it will work itself out"; "it's just old age creeping up and you gotta live with it," etc. BUT, in Amsterdam it was really something different, I've never had it affect me like that and I knew I had to do something about it. I've had several treatments since then and haven't felt this good in a long time. 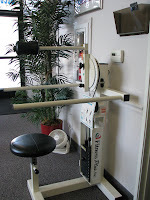 Dr. Reed has exercise machines in his office that patients can use (free). I am on two of them, one is for back and leg muscles. I started with 60 lbs, but quickly moved up to 90 lbs. In the picture is Dr. Reed's assistant, Genevieve demonstrating this machine. You push back with your feet and back to lift the weights. After I have been on this machine, I feel like I am walking a little taller. The other machine is for the neck. You sit on the stool with your hands on the bar, keep your shoulders straight and move the weight with just your head and neck. It's only on 7 lbs for me, but it really gives my neck muscles a work-out. After two sessions with the exercise machines, I had an appointment with Miguel for a reflexology treatment. One spot on my foot really hurt and he said, "it's your neck, neck muscle." I had to laugh out loud. I didn't tell Miguel I was doing exercises, but he knew my neck muscle was sore just by working on my feet. My neck is no longer sore, so I guess that spot shouldn't hurt next time. I think by going to a chiropractor and reflexologist, I should be in pretty good shape. I'm hoping to stay strong enough to keep working in the yard. Like Dr. Reed says, "chiropractic, massage, reflexology, they're all good." 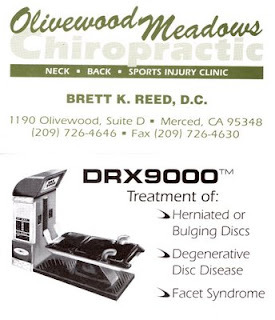 There is a sketch of the huge machine on the back on Dr. Reed's business card. I've only seen men on it so far. One day I was leaving the same time as a man who had been on the machine. I asked him how he liked it. He said he "loved it" and had never felt better. It looks like it stretches the back. I probably won't ever be on that one, but there are others. A few days after returning home from visiting my daughter in the Netherlands and trying to shake jet-lag, there were two reunions to attend. On Saturday, Sept. 27, there was a Dirks family reunion in Twain Harte. It was the first time that I had to do the driving, so I took my trusty Tom-Tom. Still, when we were almost at Cousin Dennis & Novie's house, I took a wrong turn and wound-up in someone's yard. Ina got out of the car and guided me back out of there so I wouldn't hit anything. What a tight squeeze! We had a great time and voted to have another reunion next year, instead of in two years. Cousin Jackie put up a family tree with pictures and a memorial board of those who passed on since the last reunion in 2006. My family lost four members during that time. Here is a picture of Aunt Luella and Cousins Jackie, Debbie and Nancy singing "How Great Thou Art." 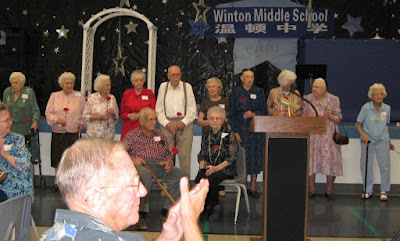 The next day (the last Sunday in September) was the Winton Old Timers Reunion at the Winton Middle School. We had a good turn-out, I think it was around 230 in attendance. This year, people 90 years and older were honored, not just the oldest man and woman. There were 13 in attendance that were 90 or more. The oldest man was Harry Tighe at 100 years old. The oldest woman was Leona Eason at 97 years old. She beat Merle Willett by a few months. Seated in the picture is Harry Tighe and Leona Eason; standing are the 90 and over. See more pictures at flickr. On Tuesday, September 9, Sandy drove Rosalie and I to Friesland and Groningen. We went over the Afsluitdijk, the dike that keeps the North Sea out of the Lake. On average about 15,000 cars and trucks cross the Afsluitdijk per day and it takes 50 people per day to maintain the dike. The Afsluitdijk is 32 kilometers long and was dedicated on May 28, 1932. We stopped at the tourist spot to take pictures and browse the tiny gift shop. Here is a picture of Rosalie and I by a monument dedicated to the workers. After we crossed the dike, we stopped at a McDonald's for lunch. We found the small village we were looking for; Witmarsum, where Menno Simons was born in January of 1496. His first church was here, there is a frame where the church stood and also a monument for Menno Simons. The small Mennonite Church in Witmarsum had a few books for sale. I purchased the large one on Menno Simons. It was the only book in English, except for "Passing on the Comfort" a story about An Keuning-Tichelaar who was born in 1922 near Witmarsum and how she and other Dutch women during WWII made quilts to raise money to help save the Jewish people in Holland. Sandy had given me this book a few years ago. The monument was over a small bridge and down a lane in a very rural setting. Very peaceful and quiet. We took several pictures, see them at flickr. We went on to Groningen and spent the night there. We found a Mennonite Church on the same street that our hotel was on. It was set back from the street, unlike the other buildings. We went inside and took pictures of the organ pipes and stained glass windows. Groningen is a college town, so there were lots of young people everywhere. (And lots of bikes!) There was a large area with with a lot of small tables and chairs outside where the young people sat and talked and ordered beer and other drinks. We found a table and sat there also. Sandy ordered some Bitterballen for us to try. It is deep-fried, crusty on the outside with some kind of gravy holding it all together on the inside. I didn't care for it that much. Rosalie liked everything, but I like my familiar foods. We went to the Archives, but didn't find David Dircks (born between 1699 - 1703). Another source says he was born in Prussia, so I guess the family had already left the area. In the Netherlands there is no central place to find old documents, you have to go to the source, whether in Amsterdam, Rotterdam or Groningen, etc. We enjoyed the trip to the Northern part of the Netherlands, we travelled over country roads part of the way, just to see what it looked like. We saw many very nice houses in the country; a large horse farm. The people living there had to be rich. For more information on Menno Simons, see this article at Wikipedia. We left for San Francisco for a direct flight to Amsterdam, Holland. Clark and Rosalie surprised Claudia and I with arrangements for a limo to pick us up at their house in Winton. We really got to ride in style. Arrived in Amsterdam the next morning at 9:30 their time. They are 9 hours ahead of us in California. Sandy met us at the airport and we took a van taxi to her house in Haarlem. We just kind of rested up the first day. The next day, Thursday, Sept. 4, we took the bus into the city of Haarlem and did some sight-seeing and a little tourist shopping. 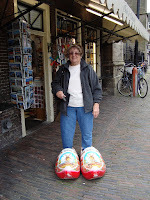 Here's a picture of me, trying on the huge wooden shoes outside my favorite shop. Later, I found a pair of wooden shoes in this shop that actually fit me. Friday, Sept. 5, my lower back was really hurting, so I stayed home with Sandy to watch the tree trimmers cut down their tall pine tree in the front yard. Rosalie and Claudia went to Haarlem by bus and toured the "Corrie Ten Boom" museum. Saturday, Sept.6, We went to Amsterdam to the Van Gogh museum. I couldn't walk a lot, so Sandy pushed me around in a wheelchair. So many rooms with lots of great paintings. Nice gift shop also. Had lunch in town and then took the tram to where we could get on a boat and ride up and down the canals. That night we walked from Sandy's house to a fancy Chinese restaurant for dinner. We really had a full day. Sunday, Sandy drove us to IKEA, between Haarlem and Amsterdam. On the way home, I took a couple of pictures of the Gate to the City of Haarlem, built in the 1300s. It's amazing to see such old structures. Monday, Claudia flew to England for a week. The rest of us went to the beach not far from Haarlem. Saw some wind surfers on the North Sea. I had an appointment with a physical therapist in Haarlem. He helped a lot, but when I got home I still went to a chiropractor. Tuesday and Wednesday, Sandy took Rosalie and I to Friesland and Gronigan to look for Menno Simons' first church and try to find my oldest Dirks ancestor at the archives. Didn't find him, but got a link to their archives online. Thursday we were back in Haarlem and did a tour of the old windmill. Sunday, Dol and Sandy had "open house" so friends and relatives could come see where they now live. (They recently moved from Amsterdam to Haarlem) Claudia came back from England on Sunday, just in time for the party. Monday, Sandy wanted to show us the "9 Little Streets" a unique shopping area in Amsterdam. We only walked down one, because I had so much pain when I walked. Bummer! It really made me feel bad. Walking back to the train station, I found a wooden birdhouse windmill for my sister who was back home taking care of my cat. I had almost given up on finding a windmill made of wood. Saw lots of very small ceramic ones. Tuesday we went to the Rijksmuseum and saw part of their collection of Rembrandt's and others' paintings. Part of the museum is being renovated, so we didn't get to see everything. But if you didn't know that, you wouldn't have noticed. We did see the famous "Night Watch" painting. I missed seeing the painting I liked better though, it was like a school class setting, I think. It had children in it. Sandy again pushed me around in a wheelchair. We had lunch close by, then Sandy drove us all over, to the neighborhood where she used to live; showed us where she used to work before her office moved to a larger building. We went to the Rembrandt park and saw the statues made in the image of "The Night Watch." Took pictures of us in front of it, like all the other tourists were doing. Walked around a bit and found the chocolate store that makes the "best chocolates in the world." We each bought some. It was very expensive, as you might guess. Thursday night we went to dinner and a movie at a place in Amsterdam called "The Movies." The movie we saw was "Brideshead Revisited," very good movie, but also sad. We took a taxi back to the train depot and then decided we could walk from there to the Red Light District. I was feeling better, thank goodness. The Red Light District was larger than I remembered it from 2001, when John and I were in Amsterdam for a few days. It was about 10 p.m. and the streets were full of people, mostly tourists, I suppose. Some of the ladies in the windows were very pretty and others not so much. They were on both sides of the canal and down one side-street. We couldn't take pictures. One lady opened her glass door and said, "No pictures please," so we didn't dare take any. We walked back to the depot and caught the train back to Haarlem and then the bus to Sandy's neighborhood. Didn't get to bed until almost midnight and then couldn't sleep, I was awake at 1 a.m. and then 2, don't know when I finally slept a little. Next morning we had to get up early to head back to Amsterdam and watch the book sellers set up for the book market. They do this every Friday morning. We had breakfast across the street and watched them. Later had lunch next to the place where we ate breakfast. They can always tell we are Americans, so when I ordered a Coke, she asked if I wanted ice (Europeans don't put ice in their cold drinks.) I thought, oh boy, finally I get some ice. I got two little pieces of ice, hardly noticeable. The next day when Rosalie, Claudia and I went to Haarlem to the Saturday market in the town square, we ate at McDonald's (at my request) and actually got a decent amount of ice in my Coke. The cheeseburger didn't have any lettuce or tomato, so not as good as in the U.S., but I really enjoyed the coke. If you want ketchup for your fries, you have to pay extra for that. So, there you have the gourmet report from Haarlem. This was Saturday, with the Market place packed with people. I guess that's why I had to pay to use the bathroom at McDonald's and also at the place where we had a carmel Latte. The next day, Sunday, was Sandy's Big Day -- The Dam to Dam 10 mile race. She was a bit nervous, getting ready to go. She left the house about 1 p.m. since she was running with the last group. They took off from Amsterdam around 3 p.m. They needed to get to the finish line by 5 p.m. in order to get a metal. Sandy was running with Dol's sister and cousin. They made it with 5 minutes to spare. The sister could have had a much better time, but she stopped and waited for Sandy and the cousin, so they could all cross the finish line together. Dol and the 3 of us visitors, took the train to Zaandam where the finish line was. It was a lot of walking from the train station and I was very tired by the time it was all over, but I wouldn't have missed it for anything. I was very impressed that my daughter could actually run for 10 miles. The next morning we had a van taxi take us to the Amsterdam airport and Sandy saw us off. Three weeks is a long time to be away from home, so I was anxious to come back. I hated to leave Sandy there,but she promised to visit me in Merced next year. We had a 10 1/2 hour flight back to SFO. Claudia watched a couple of movies, Rosalie read most of the way and I tried to sleep, but only rested my eyes. We gained the 9 hour difference coming home. Our plane took off at 11:30 a.m. Amsterdam time and we landed in San Francisco that afternoon at 1:00, California time. The limo was there to whisk us off to Winton. It felt so funny driving my car to Merced, I guess it was because I had been up for almost 24 hours and my body was tired. Dropped Claudia off at her house and had my camera ready to take Maggie's (the cat)picture as I drove in the garage. I expected her to be watching me from the cat door. That didn't happen. Was she glad to see me after being gone 3 weeks? NO. She just sat and stared at me with her little beady eyes. When I called her name, she turned her head and wouldn't look at me. She was mad and she let me know it. It wasn't until after I went to bed that she started being a little friendly and licked my arm a little. The next day, she was almost back to her normal self, but she really kept her eye on me, watching my every move. I know she doesn't like to be alone. My sister came to my house every day to take care of her and water the yard. Driving from Atwater to Merced. Well, at least I know my sister was glad to see I was home at last!! To see pictures of the trip go to flickr. You can click on details or just click on any individual picture to see what is written about it. We have been in the Netherlands since Wednesday, Sept 3. My daughter met us at the airport in Amsterdam and hired a van taxi to take us with all our luggage to her house in Haarlem, about a 30 minute ride. The next day we took the bus into the town of Haarlem, did a little tourist-type shopping and a lot of looking around. I had a hard time walking because of a pinched nerve in my lower back. The next day, Friday, the tree trimmers were coming to take out the large pine tree in the front yard. My two friends took the bus to Haarlem again, but I stayed here and took some pictures of what was happening here. On Saturday, Sandy drove us to Amsterdam and we saw the Van Gogh museum. Sandy pushed me around in a wheelchair. There's no way I could have walked it. I have uploaded some of the pictures at flickr. See them here. More to follow. 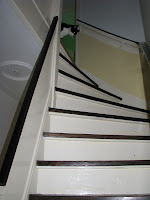 Pictured here is Bas, the cat at the top of the stairs on the 2nd floor. Claudia got the bed on the third floor, glad it wasn't me. In just a few days, I will be on my way to Holland to visit my daughter. I don't like to fly, so I am taking two lady friends with me. We will fly from San Francisco directly to Amsterdam, an 11 hour flight. My daughter will meet us there and then we will take a taxi (a van) with all our luggage and go to her house in Haarlem, about a 30 minute drive. There's a nice article about Haarlem at wikipedia. My sister is going to house-sit; cat-sit and water the yard. She is going to be very busy. Her gardener is going to come over while I am gone and remove 3 peach trees, prune back an over-grown vine and do some other clean-up in the back yard. It's going to be so nice when all that is done. I have some ideas of different plants to put in the back yard this fall. So exciting! But, back to getting ready. Thursday evening, I slammed the car door on my thumb. then the pain in my hip kept getting worse. By Saturday I decided I had to do something about it. The doctor's office was closed and also the chiropractor's. So, I went to Urgent Care, got a shot and 3 different kinds of medicine to take for the pain in my sciatic nerve. Good grief!! Is my body trying to tell me to stay home? Too late now. I will be taking lots of pictures and post them on flickr. We plan to ride on canal boats and maybe have lunch on one of them; go to several museums, including the Anne Frank museum. One friend will fly to England for one week to meet two cousins she's never met before and see where her grandfather was born and raised. While that friend is in England, my daughter will take me and the other friend to Friesland and Gronigan in the north part of the Netherlands. I am hoping to find something in Gronigan to prove my Dirks ancestors were there. Sorry I don't have any pictures to post here, but my daughter has a nice picture of an old church at the market place in Haarlem. We'll be seeing lots of old buildings. What came first, the chicken or the egg? That seems to be a rhetorical question that is never answered to everyone's satisfaction. -- So, the next question of course is, What came first, the Winton history book or the Winton Historical Society? LOL. Many people mistakenly think the "Memories of Winton" history books are a society project. They are not. Rosalie and I started working on the history of Winton in 2001, researching the newspapers on microfilm at the library and driving around to find the facts on early Winton. We finally finished the book in 2004, with part of the book order available at the Winton Old Timers reunion the last Sunday in September of that year. After the book was published, a few people in Winton thought we should have a historical society. Our first meeting was in November 2004, with Rosalie elected as president and I as treasurer. 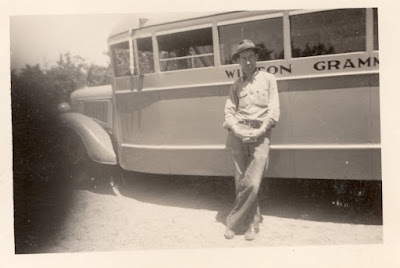 Now we are working on the next history book of Winton and we are again asking people to let us scan their pictures and maybe use them in the next book. I don't want people to think it's for the Winton Historical Society. It's a personal project of two people who get excited about uncovering historical facts and pictures of the town of Winton and her people. We hope to see you at the Winton Old Timers' Reunion, and maybe with pictures in hand for us to scan into my computer. 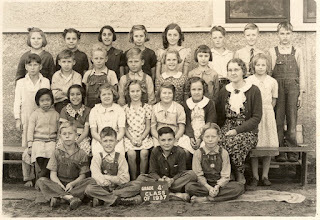 The above picture came from my aunt; it's Winton's fourth grade class of 1937. We are looking for Winton pictures, up to 1975, that are not in the first Winton history book. Thank you for any help in newly discovered pictures. A group of us met at the Community Law Enforcement Office (CLEO) on Tuesday to mail out reminder postcards for the Winton Old Timers Reunion that will be held Sunday, September 28. Registration starts at 10:00 a.m. A chicken dinner will be served at 1:00 p.m. Remember to bring your pictures of Winton, (that are not in the "Memories of Winton 1911-1950" book) from the earliest days, up to 1975 to be scanned while you wait. They may be included in the next Winton history book. This will be the last Winton book by Rosalie and Lorraine, so don't miss this chance to have your photos included. After the Winton Old Timers Reunion, we will be working hard on the next book, so let us know at the reunion or soon after if you have pictures or stories for the next Winton book. Today, my sister and I had another reflexology treatment in Turlock. Lately the muscles above my right eye have been tightening up and I feel like I must be frowning. These are the same sensations I felt 25 years ago before I realized my right eye was sinking in. People used to tell me "stop frowning" so often that I finally got tired of it and wanted to shout "I can't help it; I'm not frowning." So, now I am thinking I must be working back through and my body is undoing the damage that was inflicted upon it years ago. It was a very gradual process when all my problems started with double vision, locking jaw, etc. so it's not surprising to me that it is a gradual process getting back to normal. I've made giant leaps with the healing through reflexology and I would be very happy with the status quo, but I am now confident that more healing is taking place. Read what Kevin Kunz says about "going back through" in his blog. I know some people expect a complete healing with one reflexology treatment, but that probably depends on how long they've had the problem or how severe it is. Today I tried out my new compact camera on Miguel and his wife, Blanca. It's a Kodak Easyshare V1273 and it takes really good pictures, but the operator needs more practice with it. 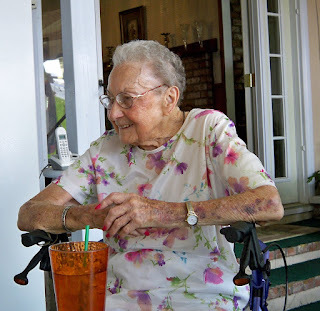 Yesterday was Verna's 95th Birthday Party. Her daughter invited many friends and relatives to their home to help Verna celebrate her birthday. A delicious home-cooked meal was served at noon. Verna's family of Smith and Logue helped develop the town of Winton when it first started in 1911. Winton will soon celebrate its' 100 year anniversary. Also in attendance at Verna's party was Harry Tighe, who just turned 100 this summer. Harry is doing very well and I expect he will be the oldest man in attendance at the Winton Old Timers again this year. (Sunday, Sept. 28) All those 90 years old and older will be honored, so encourage the Winton senior seniors to attend. 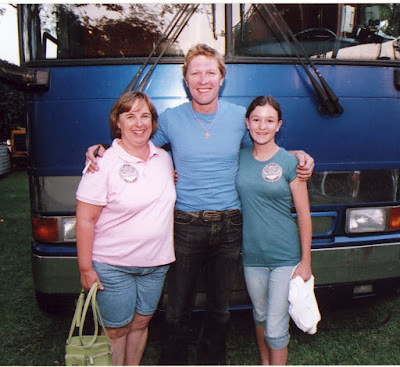 Yesterday I picked up this picture at the Merced County Fair office of my daughter and granddaughter with Craig Morgan. My granddaughter had to come to Merced to see Craig Morgan's show at the fair. They were lucky to get "Meet & Greet" tickets to go backstage where this picture was taken. When Laura went back to school, she told her friends that she met Craig Morgan. They didn't believe her. Now she will have proof, as soon as I mail this picture to her. Also yesterday, we had a meeting at the Winton Historical Society at 1:30, so to save on gas, I decided I would go in the morning and take pictures of tombstones at the Winton Cemetery. Well, when I got there, my rechargeable batteries were DEAD! The one thing I should have remembered from the camera class is; "Always recharge your batteries before going to class" (or leaving home). So, I had to go buy some regular batteries and still had time to take a few pictures. I thought I would go back after our meeting and take pictures for the requests I had, but it was so hot by then. I did find two of them. Oh well, another day. I had several other errands to do and it seems like it's hard to think of more than one thing at a time. Good thing I gave up chewing gum. People keep asking Rosalie and I "when will the next Winton book be done?" We thought it would be finished before now, but so much has been happening. My husband was getting cancer treatments for a little over a year before he died in May last year. My brother broke his neck and was a quadriplegic for about 15 months before he died in February of this year. I had two brothers-in-law die, one two years ago and one this year. So, it's been hard emotionally for me. The most devastating was when my husband passed away. Besides the emotions you go through, the work has doubled. He used to take care of most of the yard and did the cooking. I'm still trying to sort things out, decide just how much can I really do myself. I have way too many fruit trees in the backyard, and I think I will have more taken out. It's just too much work. Well, I didn't plan to go on about my personal stuff. About the Winton book: Rosalie and I plan to 'hit it hard' after the Winton Old Timers. We are hoping that more people will bring their pictures of Winton and people of Winton to the Old Timers so I can scan them into my laptop computer. This next book will have the history of Winton from 1950-1975. We have already researched the information in the old newspapers. I don't have that many school pictures. I did get a 1934 fourth grade class picture from my aunt and even though it's an older picture we will include it since it was not in the first Winton book. (Memories of Winton - 1911-1950) So, if you have pictures, that are not in the first Winton book, we would be interested in scanning them and may be able to include them in the next book. Thanks. You can email me at CalifNative37@aol.com People who know me can call or email. The above picture of Dave Koehn, the bus driver is also from my aunt. Probably taken in 1942. 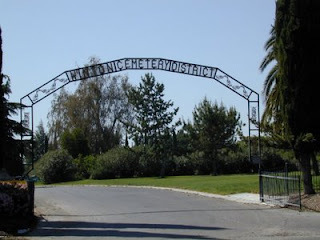 Pictured is the gate from Cypress Avenue, where you can enter the Winton Cemetery from the back. It's across from Winton Middle School. The next picture shows how nice the cemetery is kept up. It's always green and there are lots of flowers on the graves left by family. The good news for us out in cyberspace is the volunteers at The Tombstone Transcription Project are working on Merced County indexes. Go to the website and click on Merced. Scroll down to Winton and click on the camera. I have uploaded a few more pictures that were on my computer. I plan to visit the cemetery soon and take more photos to upload. If you have a picture of a tombstone, read the directions and have your picture displayed online. If the picture is not too large, it will show up in the index right away, with the last name and some numbers until they get a chance to finish indexing it. I just found out the Winton Cemetery District has a website also. 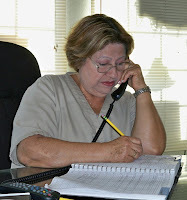 Click here to read more information about them, the Board Members, the employees, the servies they offer and the prices. My daughter and her two teenage kids came for a visit Tuesday. They wanted to see the Merced County Fair. Before they moved to Orland, they lived in Merced and showed their dairy cows here. I am enjoying their visit. Yesterday my sister invited us to swim with her, so I took a picture of my grandchildren in the pool. After the swim we went to the Jantz Cafe for lunch. It was Wednesday, so we had free pie. Again! We met up with other relatives at the cafe and we managed to get a large table so the eight of us could have a good visit together. It was a very enjoyable day. Seven people who retired from the Assesor's office met for lunch today. Well, actually, one is still working, six of us are retired. It was fun to catch up on what has been happening in our lives since the last time we saw each other. We decided that we need to do this more often. Three of us have lunch quite often, about once a month. Our husbands call us "The Golden Girls." It was fun having the larger group and we had a lot of laughs. I decided not to mention any names, people who know us will recognize us.